Following rigorous judging, a county Galway food business was named among the top seven winners in the 2016 National Organic Awards. Some 278 individual products were submitted in the Awards, a record high level of entries. Galway’s Green Earth Organics received the Direct Selling Award for its 100 per cent Irish Veg Box, which the business sells online making it easy for shoppers to access locally-grown, organic produce. The latest figures from Kantar Worldpanel indicate a significant upturn for the Irish organic sector. Building on the momentum of last year’s growth of over six per cent, the new figures, published by Bord Bia today, show a further year on year increase of 23.7% to bring the total value of organic grocery sales to €142 million. 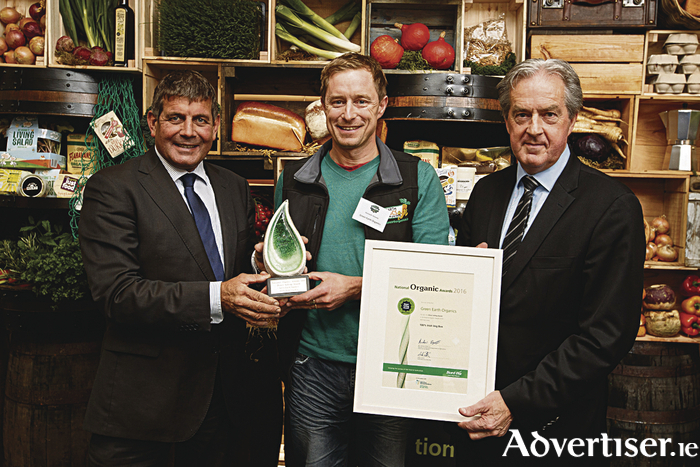 The figures were announced today during the National Organic Awards which took place in Bord Bia’s Dublin headquarters. Over 70 industry representatives gathered for the event which rewards quality and excellence within the Irish organic sector across categories including best new product, chef’s choice, export and innovation. He added “the quality of Irish organic produce submitted for this awards competition, clearly shows that Irish organic food has the high quality and standard required to compete on the world stage. Today is a celebration of your achievements as Irish organic food and drink manufacturers and I wish you every success”. Meanwhile, on the domestic front, almost 94 per cent of Irish shoppers are reported to purchase organic goods, on average once every two weeks. According to Kantar data, Irish consumers are making more organic purchasing trips, with organic becoming more accessible with smaller pack formats and more affordable organic products on offer. This year’s prestigious judging panel included JP McMahon, Michelin-starred chef from Aniar restaurant, Co. Galway; freelance journalists Suzanne Campbell and Oliver Moore; Alan Kinnear, International Buying Manager, Ocado, UK online retailer; Al Overton, Head of Buying, Planet Organic, UK’s largest fully certified organic supermarket; Lisa Garrett, Innovation Chef with Le Pain Quotidien restaurant, based in Kildare Village and chairman Evan Doyle, Owner The BrookLodge Hotel, Macreddin Village, Aughrim, Co. Wicklow. Companies Act 2014 - have you converted yet? Page generated in 0.1248 seconds.